Cartilage is an important component of movement organs. Its damage or degeneration results in serious disturbances in joints functioning. Among the causes of cartilage degeneration we can list: competition sports, chronic inflammatory reactions or hormonal disorders. Due to the lack of vascularization in cartilage, osteoarthritis often starts asymptomatically. Glucosamine sulphate, chondroitin sulphate and MSM are classified as SYSADOA (symptomatic slow acting drugs in osteoarthritis) substances. It is a group of medicines used for osteoarthritis treatment. Glucosamine is a aminomonosaccharide compound naturally present in the body. It is a precursor for the synthesis of proteoglycans and glycosaminoglycans, important components of the intercellular substance of articular cartilage. Glucosamine has anti-inflammatory properties. It has been proved that glucosamine inhibits proinflammatory cytokines (IL-1β) and reduces the production of prostaglandins (PGE2), supporting the repair processes of articular cartilage. Glucosamine production in human body decreases with age and due to the lack of food sources of this substance, its supply is possible only through adequate supplementation. Chondroitin is a mucopolysaccharide naturally contained in the basic substance of synovial fluid and articular cartilage. Chondroitin in form of sulphate is registered as a medicine and dietary supplements. Chondroitin sulphate plays an important role in making cartilage resistant to pressure and eliminating the friction in joints. It also belongs to the extracellular matrix, where it forms protegrlics. Chondroitin sulphate proteoglycans demonstrate high water binding capacity. They also aggregate with hyaluronic acid and in this form bind water creating hydrated gel. This structure, due to its high density, protects against the penetration of undesirable substances and cushions the joints. Methylsulfonylmethane (MSM) is an organic sulphur compound, an essential chemical element from macroelement group. Sulphur in form of MSM is biologically available to the body. MSM presents anti-inflammatory and antioxidant activity. It leads indirectly to decrease in concentration of proinflammatory cytokines IL-1 and IL-6. Inflammations are the main cause of joint diseases, including RA. Their suppression is the primary goal of pharmacological treatment. MSM supports proper functioning of joints. Acting anti-inflammatory, MSM influences the inhibition of progressive osteoarthritis and reduces pain in joints. Study conducted on humans has shown that as a result of MSM supplementation in patients with osteoarthritis pain was reduced by over 80% (compared to 18% in the control group). Lack of optimal connective tissue regeneration can lead to disturbances in motor system functioning. That is why proper regeneration is important especially for people who are intensively "exploiting" their joints such as: athletes, physically active people and people performing physical work. 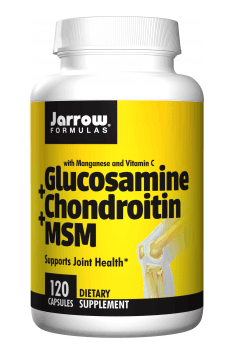 Jarrow Formulas Glucosamine + Chondroitin + MSM is a dietary supplement recommended especially to sports and recreational athletes and people performing physical work. It supports joints and movement system health and also helps in degenerative joint diseases. Comprehensive product for arthritis. It's understood that for the dose to be effective, you have to take at least 4 capsules per day, preferably divided into two doses (2 capsules). Therapy should last at least 3 months, although its effects can definitely be seen before. I know from experience that when taken regularly, the pain and unpleasant "creaking" or "crunching" in the joints disappears. For best results, it's worth adding collagen to the supplementation. A rich-component, wide-spectrum pre-workout with a high dose of BCAA and L-glutamine.